Download Meter iPhone App Review. With so much of our lives now spent online and our iPhone becoming our trusty companion for nearly everything and everywhere, one of the issues is data usage and costs. 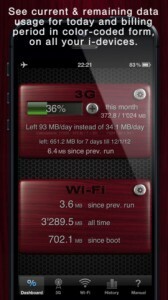 Carriers will normally display 3G data usage information, but you need to go to their website and check that out. Most often than not, those websites are really not mobile-friendly. Not to mention, there's no real time stats or any data available for WiFi usage. This is where Download Meter comes in. It's a nice piece of app that will pull together 3G data usage as well as WiFi usage in one easy to navigate window. While its utility can't be negated, I have some concerns over the app actually becoming a burden in some situations. An extra step necessary when navigating the web, if you will. How does Download Meter work? Once you donwload the app from the AppStore, you'll be taken through a nice little tutorial that explains everything in a couple of screens. You can surely skip it, but I suggest you go through it. It's not long and it's actually informative. 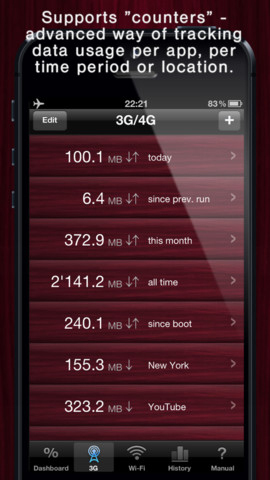 After that, you're all set up to track your data usage, on both 3G and WiFi. The first step you need to do is set up the 3G limits. How much MB can you use on a monthly, weekly or daily basis and when does the billing period start? Download Meter will then show you how much you have left and also do some other useful calculations like what's the average amount of MB you still have at your disposal per day until the end of the cycle? 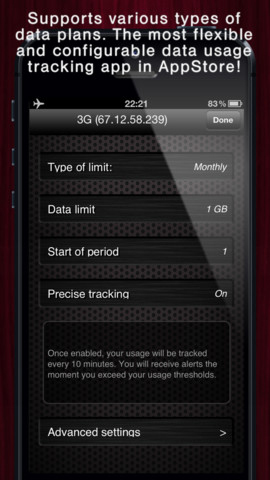 You can set up alerts for 3G as to when you reach certain levels of data usage. This is not true for WiFi, since there are no limits there. The WiFi stats will display information like how much MB you've used since your last app run and all time since installing the app. For both 3G and WiFi you can easily set up personlized counters for the various internet activities you want to track data usage for. As an example, if you're into wathcing Youtube videos on 3G, that might be an issue if you want to stay within your data plan limit. So you can just set up a 3G counter specifically designed to count MB used when watching videos on your device via 3G. It's easy enough to do, but not as easy to actually put into practice. The first and only step when setting up a counter is to go to the appropriate section in Download Meter (3G or WiFi) and just create a new counter via the "+" button. Give it a name and that's it. The app will now track usage whenever you access the internet. That's right. Whenever you access the internet, not just for that specific action. In order to make the app counter you just created actually work, you need to remember to start and stop it only when you perform the specific action you created the counter for. So if you created a video counter, make sure it's only running when you're watching video, otherwise, it loses its purpose. That means that when you want to watch a video, you need to first start the Download meter app. Then go to 3G or WiFi then start the counter. Go back to your video and play it. When you're done playing it, go back to Download Meter and stop that video counter. Can you see my concern? Watching a simple video should not be that complicated. Starting and stopping counters is counter-intuitive (pun intended) as well. After you create a counter, it's automatically started for you. If you want to stop it, you need to go that counter's details and try to find a stop button. Stop looking, there is none. Instead, tap "Edit" and then choose Pause from the popup menu. The same goes for when you want to start a counter. So, let's go back to the video example and count the steps you need to watch a video if you want to track data usage accurately. By my count, you need exactly 11 taps to watch a simple video, and that's if you already created the counter. One by one...Start Download Meter. Go to 3G/WiFi. Tap the counter. Tap "Edit." Tap "Resume." Tap "Home" button on iPhone to go back to home screen. Open video. Once video stops playing, go back to Download Meter (that's one double-tap to open multitasking and one tap to open the app). Tap "Edit." Tap "Pause." That's a lot of hassle to watch a video. Better you just watch that while on WiFi if you're worried about data usage. The app automatically starts with your device and works in the background if you allow it. It checks data usage every 10 minutes and shows alerts when you reach your predefined levels. This will slowly kill your battery, obviously, so you need to make a choice of whether you want to charge your device more often or you want to pay attention some other way to your 3G data usage. The thing with WiFi is, it's meant to be free, so while I'm on WiFi, I don't particularly care how many MB were consumed by the app updates I just did from the AppStore or how much video I watch. So that leaves me with 3G data usage, on which it's nice to have real-time stats, especially since not everyone has unlimited data plans. And for a one-time price of $1.99, I don't mind accessing Download Meter every once in a while right from my device, instead of logging into the carrier. But, if a time comes when the carriers wake up and actually provide us with meaningfull and easy ways to access such data, they will surely negate the point of Download Meter altogether. What do you think of Download Meter? Scroll down for our comment section and let us know!